This vintage "streetcar boat" lay at the bottom of Lake Minnetonka until the 1980s. 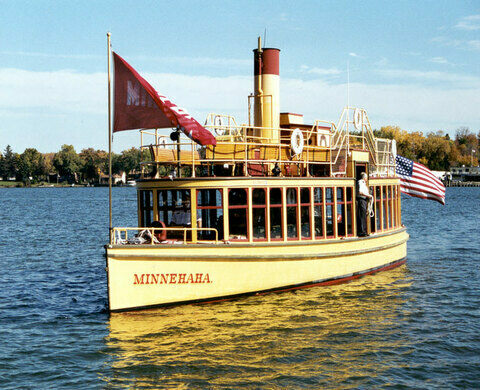 In the early 1900s, the steamboat Minnehaha was an integral part of the Twin Cities’ commuter transit system. 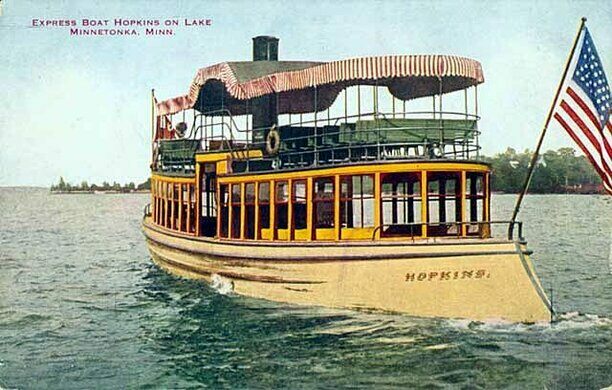 It was one of several boats built to act as feeders for the newly developed street car system at Lake Minnetonka. A Foundry on a Sleepy Street. The lake area was quickly developing, but all the capes and bays around the lake made it impracticable to run a streetcar system close to the water. So boats were built to extend the line, transporting lakeside residents to and from the streetcar link to Minneapolis. The boat service boomed for a time, but with the 1920s came the automobiles, and the transit business started to struggle. In 1926 the steamboat service was discontinued. Several boats were scuttled, including the Minnehaha. The boat was discovered again in 60 feet of water, by a diver in 1979. It was eventually recovered and by 1996, following a long period of disputed ownership, it had been restored and given a second life as a floating museum. This magnificent and historic boat has been operated by the Museum of Lake Minnetonka since 2004. 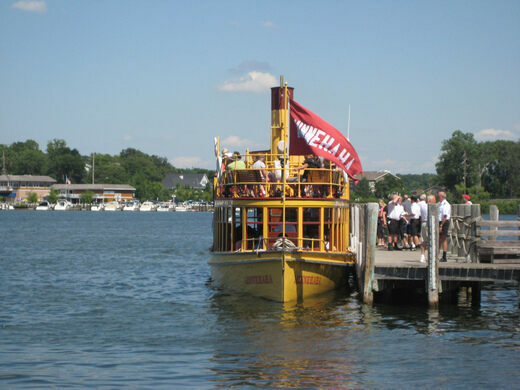 The museum runs the Minnehaha from ports in Excelsior and Wayzata during the summer and fall, and offers various different excursions. It is currently the only authentic passenger steamboat docked in Minnesota. Find out what it sounds like when doves cry at Prince's recording studio estate turned museum. Direct, creative challenge to Mother Nature's winter wrath. One of the few places where you can explore a 1918 paddlewheel steamboat from stem to stern. The 19th-century vessel floats proudly on Lake Titicaca, but its journey from Britain to the Peruvian altiplano was far from smooth sailing. 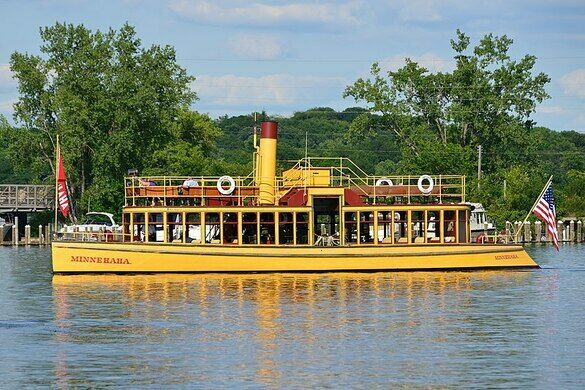 The oldest operating Mississippi River-style steamboat still navigates the Ohio River.